With the Renegades before the show. 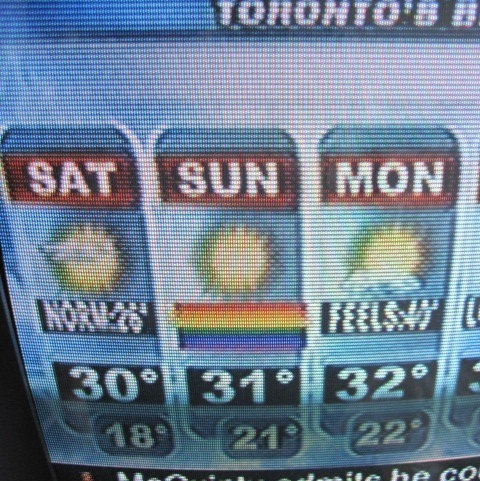 I’ve never been one to go nuts over rainbows and Pride, but I have to admit the way Toronto handles it is an experience. It wasn’t the size alone (with was staggering) that was amazing, but more so the way the city responded to Pride. In Toronto, Pride is treated like any other holiday. Stores in the main shopping drag of the city hung rainbow flags and ‘gay’ themed store displays. Now, I realize that its all corporate consumerism, but even with that it was strange to be so… normalized. 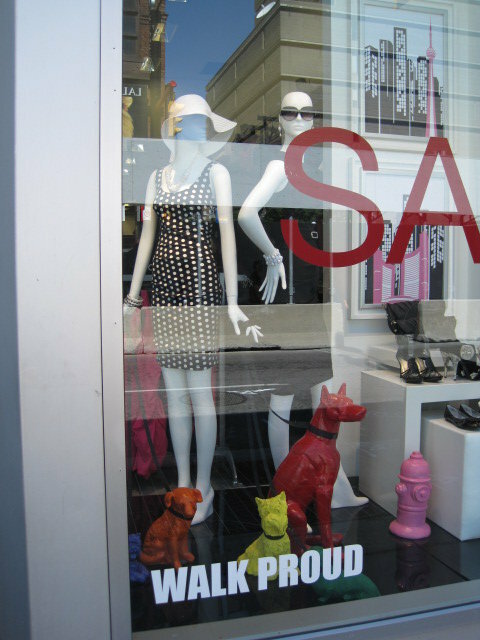 There’s little chance of any mall in Cincinnati having store after store with queer themes. People wouldn’t go to them out of protest, but in Toronto people don’t think twice. The Pride parade was also televised live in full as well as evening coverage; it was even on the weather. Granted, Canada is arguably one of the most liberal, queer-friendly countries in the world and Toronto is its largest, (and most liberal) city, so talking about how queer friendly it is may seem redundant. Even so, its not something this Midwestern boy is used to. I wonder if it is like San Francisco Pride,or New York, or D.C., but even there I don’t know if Pride is on the weather. I can’t even put my finger on the feelings surrounding it because its something I’ve never experienced on this scale. I was hoping to see tons of transfolk at Pride, but sadly I didn’t. I missed the Trans March by a day, I guess after the march all the trans folk didn’t want to come out (maybe they were too tired, ba dum ching!) I saw a couple older women, but I couldn’t even spot any folks that could be either lesbians or transguys but you can’t tell. It was surprising and disappointing… I asked around, but to no avail. I’m curious as to what the trans community is like there now. All I could find out was that the guys and gals were pretty separated, and most transmasculine folks seemed to be younger and have ‘different interests’ from the women. Sound familiar? Eh, well, guess I’ll have to go back and look some more. The visibility and normalization, if you will, of Toronto Pride left me thinking about my own recent experiences with Cincinnati Pride and the controversy of accessibility and inclusion. Toronto seemed to do a good job with family-friendly and youth-specific spaces, as well as safe spaces for various parts of our community including the disabled, trans and gqs, and POCs. There was also a pretty prominent international presence in the parade which was awesome. I am certain that all Prides have their issues, but as a literal foreigner I wasn’t savvy to them. It made me think about the attempts of sanitizing Cincy Pride, and further reiterated my feelings on the issue. From what I could tell from being present in the festival, working with volunteers, and attending events, Toronto’s way of managing Pride was very community run and community focused. There was a surprising lack of corporate ads etc with a plethora of community groups and locally run industry (even the city transportation services were in the parade). Maybe a good idea for Midwest communities would be to have community marches. The Toronto Dyke March grossed 200,000 – which I learned from the news coverage about it. Of course, a big place like Toronto has the resources and people power for such a thing which stresses how a city with low community resources can raise all the money it wants for pride, but without a supported people all you’ll end up with is a shell of a festival with low representation and even lower involvement. As for an update on Cincinnati Pride workings, there isn’t much of one. After a brief period of motion and success the opposition seems to be stonewalling us, so we must push on and keep up the work until some sort of resolution and be accomplished. Maybe one day Cincy pride can manage something like Toronto (to scale) but we haven’t gotten there yet. Hey there, I’m a young genderqueer and I’m having a hard time finding unisex clothes in the cin- northern ky area. any suggestions as to where I can look?